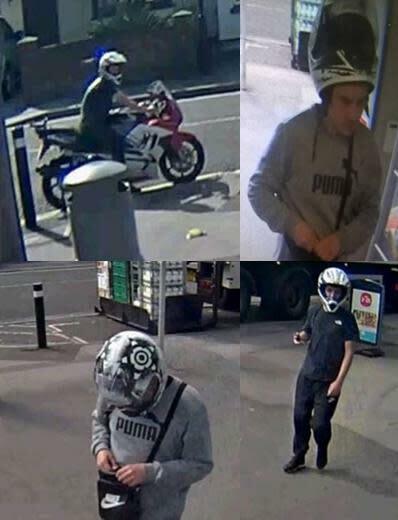 We are seeking to identify two men pictured in CCTV images in relation to the theft of cigarettes from the back of a delivery lorry. The incident occurred between 2.20pm and 2.35pm on 16 September, at the Co-Op at South East Road, Southampton. Two men are believed to have walked past the lorry which was making deliveries to the Co-op and stolen a bag containing approximately £1,900 worth of cigarettes. Do you have dashcam footage of the motorbike travelling in the vicinity before or after the incident? We would also like to hear from anyone who may have been offered cigarettes for sale in unusual circumstances in the locality. If you have any information about this incident, please ring 101 quoting crime reference 44180350122, or call Crimestoppers anonymously on 0800 555 111.